What an experience this has been for The Life Experience School which over a quarter of a century ago embarked upon an extraordinary peacemaking mission that took on greater meaning following the passing of a young student named Norman Nylund who lost his battle with cancer. Norman saw the world through the lens of autism which heightened his appreciation of animals and nature, textures and sounds. As we spent time with him, we grew to appreciate the beauty, joy and love his world offered him, and through him, all of us at the Life Experience School. Sharing the same birthday as St. Francis of Assisi, the patron saint of animals and the environment, it was decided that upon his passing in 1986, a portion of Norman’s cremation remains would be scattered at the cloistered garden of San Damiano in Assisi, Italy. Norman and St. Francis shared something quite profound which would shape the philosophy of the school, its mission and its peacemaking programs into the next century. 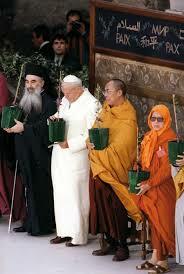 The trip to Assisi with his ashes happened to coincide with the United Nations Int’l Day of Prayer for Peace. Upon returning to the School, the prayers were shared with the students who found special meaning in their recitation and began, as a school project, sharing them through what they called Peace Seeds. 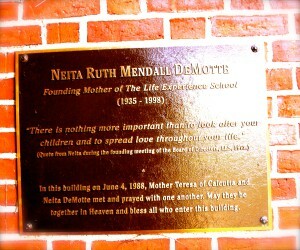 Then on June 4, 1988, the 20th anniversary of Robert F. Kennedy’s assassination, (the School is dedicated to RFK), Mother Teresa visited the Life Experience School in support of our peace work – and the rest is history. 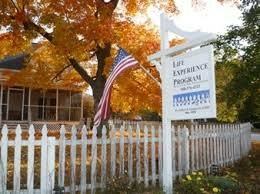 Learn more about the Life Experience School. A place where the ideals of the sixties live on! THE PEACE ABBEY FOUNDATION | 16 Lavender Street, Millis, MA 02054 | 508.655.2143 | administration@peaceabbey.org.